— Just out of high school in ’69, my mother found a summer job waitressing at Claudia Sanders’ Dinner House in Shelbyville, Kentucky. There she would frequently see Claudia’s spouse Colonel Sanders, the man behind the lucrative Kentucky Fried Chicken franchise. My mother was “just a tiny thing” and as part of her job she would carry a huge tray with 7 or more large serving bowls, quite awkwardly and in full view of Claudia and the Colonel. Mother recalls one of her sisters coming to the restaurant to visit her with my two cousins, who were only 3 and 5 years old at the time. The children saw Colonel Sanders and asked if they could meet the white-bearded American icon, but were told that he was too busy. Apparently the Colonel overheard and made his way over to meet them saying, “I’m never too busy to talk to children.” A few years later, another cousin of mine worked for Colonel Sanders as his bodyguard; rumor has it that he got this job because his mother, my uncle’s wife, was somehow related to the man. In 1979 I am born in Minnesota and a year later Colonel Sanders dies in Louisville, Kentucky, where I frequently travel as a child to visit my mother’s family. In 1999 I go to Nepal for the first time and then every year thereafter, living there years to months at a time. 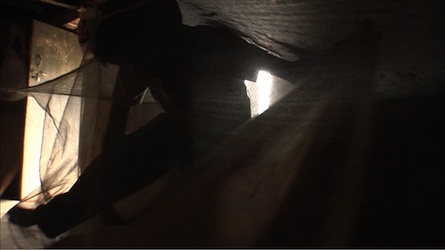 Thanks to my involvement in the Sensory Ethnography Lab, I begin making films in Nepal in 2006. In 2009 I shoot As Long As There’s Breath, which is comprised of a series of vignettes of my adopted Nepali family alternately lounging and gossiping at home or working in the fields as day laborers. These scenes are loosely organized around brief conversations or references to the family’s teenage son who left home to join the Youth Community League, a militant political group. 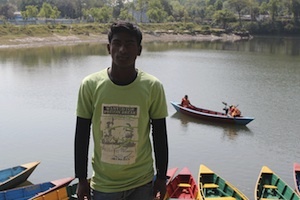 This son, Kamal, never appears in the film, although we see his younger brother, Lakshe, making a bed in the first scene. That same year KFC becomes the first foreign fast food franchise to open in Kathmandu on Durbar Marg, a relatively wide street running in front of the former kings’ palace. Not long after I complete As Long As There’s Breath, I learn that the older son Kamal has left the Youth Communist League to look for work in India. Whenever I ask what Kamal is doing, they say he’s found work as a security guard, although for what company and where no one seems to know. The family wishes they could have sent him to the Middle East where he might have gotten a cushy indoor job at a grocery store or restaurant. While the first claims it will provide employees with “Free Ticket! Free Ticket! !” the second says, “Free visa! Free food!! Free housing!! !” The final interviews for the “Free visa! Free food!! Free housing!! 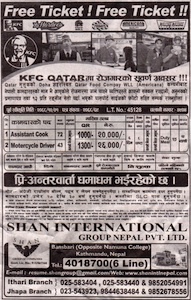 !” KFC opportunity are to be held on April 5th, 2012. This very day I invite Bindu and her son Lakshe to Pokhara. I rent a boat and shoot Bindu as she attempts to paddle while seated at the stern. She talks about her domestic troubles and increasing concerns about her two sons. We hear the female Nyāuli bird singing its mournful song in the Rani Ban, or the Queen’s Forest, along the edge of the lake. Bindu tells me that in their previous lives, Nyāuli females were young brides who died not long after their wedding day, before they could return to visit their mother and father’s village. Forever separated from their childhood home and their beloved, they are doomed to cry out in longing for them deep within the forest. Last I heard, Lakshe too had gone to India and is now likely somewhere in Bombay. The family doesn’t seem to know what kind of work he has found. 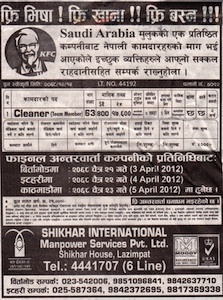 I have never been to the Kentucky Fried Chicken in Kathmandu, but know that shortly after I returned to the States from Nepal in 2012 that it was closed temporarily because employees had threatened to kill the manager. Stephanie Spray is a filmmaker, anthropologist, and occasional phonographer. She has been working and teaching in the Sensory Ethnography Lab at Harvard University since 2006. Her most recent film MANAKAMANA (co-directed with Pacho Velez) won first prize in competition at the 2013 Locarno Film Festival and led to a nomination for an Independent Spirit Award.